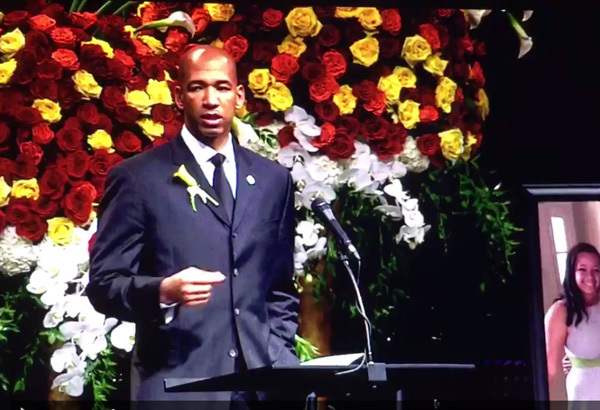 The powerful message of hope and forgiveness that came from Monty Williams is just awesome to witness as one who is also a follower of Christ. How can anyone who loves Jesus not admire the fitting tribute that was given to both his wife – evidently a strong woman of faith – and to God, who is so obviously precious to this family? I’m thrilled to see that this video has gone viral, landing now somewhere in the tens of millions of views across various social media outlets. I don’t typically expect an NBA commentary crew to be introducing videos that so clearly articulate the gospel, but it sure is a wonderful thing! I do believe in God. I’d like to believe that I have some faith, but I don’t have this man’s faith. I could not have done what this man did yesterday at the funeral of his 44 year old wife and 5 children in attendance. It brought tears to my eyes when I first saw it and, like [show host] Molly, I’ve watched it at least 5 more times because I’m just sort of dumbfounded by it because, I watch it and – not to get too deep but – I’ve sat through a lot of sermons in my time. This was as great and powerful a testimony beyond any sermon I’ve ever watched for believing in and trusting in God, that I have ever seen. And it came straight from this man’s heart with no tears, and no notes. He had notes, but I watched carefully and…he doesn’t look at his notes. He spoke from his heart. And the message was that we can’t always know why a tragedy occurs. And for him, what a tragedy! It’s inexplicable. That’s all I heard anyone I’ve talked to around the NBA. How do you explain this? And he’s saying, ‘you can’t right now, but sometime later it will all come clear because God is in control.’ God’s got this – that was the message. And he said, ‘as hard as it is, as hard as it is on my family right now, and on me right now, this will all work out because God always works it out.’ And some people say, how can you think that right now? And he said ‘I didn’t lose her. I know where she is. I envy her because she’s in heaven.’ What a great thing to say! So he misses her dearly, and he gonna miss just hanging around the house with her and the kids doing absolutely nothing. And I hurt for them as they go forward because they’re gonna go through a rough patch here, but if you have God in your heart and you trust it [sic], you’ll get through it. And that’s as powerful a message from this man as I could ever imagine. God bless him and God bless those five kids. And I hope – if you haven’t seen it, just go on youtube and just watch it a couple of times. Let it touch your heart, because we all have to go through our share of tragedies, and maybe it’ll help you the next time you suffer one. I would just like to say a couple of things to help Skip and anyone else in his position who look at this whole thing and are left dumbfounded and unable to explain it. There is an explanation. Monty knows what it is. Every true believer knows what it is. I want you too also. The first thing is that Monty’s faith is not what is getting him through this. That’s the way it appears to those looking on. But it’s not his faith. Rather, it’s the object of his faith. It is God! God is the one who is giving Monty the comfort and power to say those kinds of words. God is the one who has promised to take those who love him to be with him in heaven. Monty doesn’t have some vague, naive hope that his wife is in a better place. No, he has real faith that knows she is with Christ because Christ promised to prepare a place for those who love him. And, Jesus Christ showed that he had the power to make those kinds of promises come true by rising from the dead! Monty has faith – but so do billions of other people. Just having faith in something can be helpful in times of tragedy. But not if the object of the faith is a figment of the imagination. The reason that Monty can do what he did is because God’s not dead. He is alive! The second thing to know for those who find Monty’s demeanour and attitude inexplicable is that the only way to feel that way in the midst of such heartache is to have set your joy in God. The reason Monty’s reaction stood out so much is because few people respond to tragedy that way. We usually curse God, hate life, lose hope, and shrivel up in despair. But that doesn’t have to happen. It only happens if your greatest joy is in this life – this temporary life that is fading away. But if your hope is set in God, then heaven is your home and eternal life is your destiny. You can suffer significant loss here, painful as it may be, because you will gain it all back there. For believers in Jesus, the promise of being with him for eternity is our greatest joy. It is a reality we must wait to experience. But as we long for that day, we can endure the struggles of life, because we know they are only for a little while, and will one day be paid back one hundredfold in the life to come. Monty not only believes these verses. He has experienced them. Quite frankly, so have I. And so have millions of Christians all over this planet. We do not always have the faith to express it very well, but in a moment of triumph God gave Monty the strength at the right time to send out a message to the world that God truly is worthy of our hope and trust. Skip is right to say that this video is about as powerful a testimony to the reality of God and his goodness as you’ll ever see. My follow up to that would be: don’t waste it! Don’t catch a glimpse of the glory of God at work in the life of a suffering person and then let the awesomeness of it slip away into the night. Seek it. Pursue it. Wonder at it. And embrace it! Skip’s opening statement was “I have some faith, but I don’t have this man’s faith”. He’s probably right. I pray that for Skip, and for many others, that would no longer be the case.